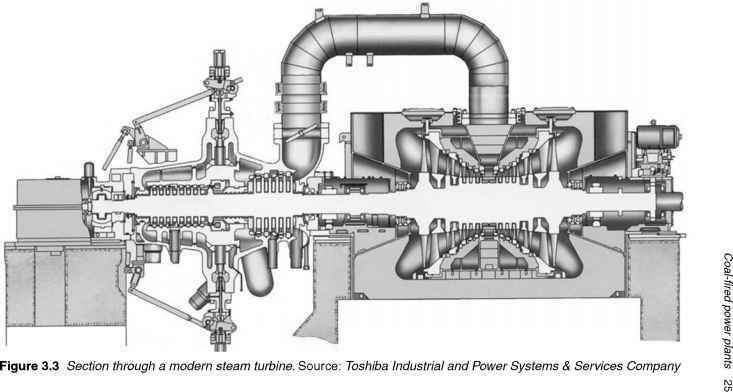 The steam turbine is the primary mechanical device in most conventional coal-fired power stations. Its job is to convert the heat energy contained in the steam exiting the boiler into mechanical energy, rotary motion. The steam turbine first appeared in power applications at the end of the nineteenth century. Before that steam power was derived from steam-driven piston engines. The steam turbine is something of a cross between a hydropower turbine and a windmill. It, like them, is designed to extract energy from a moving fluid. The fluid is water, the same as the hydro turbine. In the case of a hydro turbine the water remains in the liquid phase and neither its volume nor its temperature changes during energy extraction. In the case of the steam turbine, energy extraction is from a gas, steam, rather than a liquid and involves both the pressure and the temperature of the fluid falling. This has a profound effect on the turbine design. Both hydro and steam turbines exist in two broad types: there are impulse turbines which extract the energy from a fast-moving jet of fluid and reaction turbines which are designed to exploit the pressure of a fluid rather than its motion. A hydro turbine will be of one design or the other. In a steam turbine the two principles may be mixed in a single machine and they may even be mixed in a single turbine blade. It is impossible to extract all the energy from steam using a turbine with a single set of turbine blades. Instead, a steam turbine utilises a series of sets of blades, called stages. Each stage is followed by a set of stationary blades (usually called nozzles) which control the steam flow to the next stage. A single steam turbine stage consists of a set of narrow blades projecting from a central hub. (In concept, it is something like a steam windmill.) Ten or more sets of blades can be mounted on a single steam turbine shaft. This combination of shaft and blades is called a rotor. The turbine stages are separated by carefully designed stationary blades, or nozzles, which control the flow of steam from one set of rotating blades to the next. The precise shape of the blades in each set determines whether that set is impulse or reaction, or a cross between the two. The hub, blades and nozzles are enclosed in a close-fitting case to maintain the steam pressure. In a steam turbine impulse stage, energy is extracted at constant pressure while the velocity of the steam falls as it flows across the blades. The steam is then expanded through a stationary control stage to increase its velocity again before energy is extracted from another set of impulse blades. In a steam turbine reaction stage, by contrast, both pressure and velocity of the steam fall as energy is extracted by the rotating blades. drop, the more energy can be captured from the steam. Consequently the most efficient power plants condense the steam back to water at the end of the turbine. Even with a modern design it is impossible to capture all the energy from the steam efficiently with a single multiple-stage turbine. Coal-fired power plants use several. These are usually divided into high-, medium- and low-pressure turbines. The blades in these turbines get larger (longer) as the pressure drops; in fact, the low-pressure turbine may comprise several turbines operating in parallel to gain the most energy without making a single turbine impossibly large. All the turbines may be mounted on a single shaft, but it is common for the low-pressure turbines to be on a separate shaft rotating at a lower speed to reduce the forces exerted at the blade tips. Multiple turbines of this type can have aggregate outputs of over 1000 MW. As with boilers, the demands of modern power plant design have led to the development and introduction of high-performance materials that can cope with the extreme conditions encountered within a steam turbine. The high-pressure turbine blades have to be able to withstand extremes of both temperature and pressure and have to be able to resist the abrasive force of steam. At the low-pressure end of the turbine train the large size of the turbines means that the blade tip speeds are enormous, again requiring specially designed materials to withstand the centrifugal forces exerted on them. A refinement which improves the overall efficiency is to return the steam to the boiler after it has passed through the high-pressure turbine, reheating it before delivering it to the medium-pressure turbine. Most modern steam turbine plants use this single reheat design (multiple reheat is also possible). 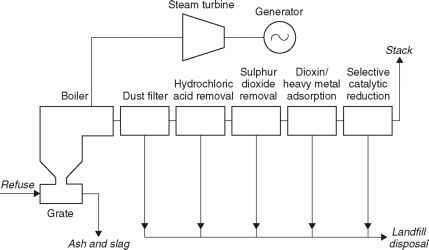 The theoretical maximum efficiency of a coal-fired power station is determined by the temperature difference between the steam entering the high-pressure turbine and the steam exiting the low-pressure turbine. The greater this temperature difference, the more energy can be extracted. With the most advanced technology, utilising the best boiler materials to achieve the highest-steam temperatures and pressures, a maximum efficiency of around 43-45% can be achieved. New supercritical designs may eventually push this as high as 55%. 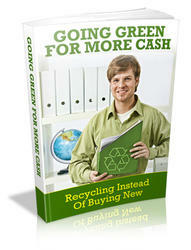 In the near future, however, the best that is likely to be achieved is something between 47% and 49%.